It’s time to play Vivers! During December and January, we’re running our inaugural Vive Active Bingo. It’s all about discovering new classes and instructors that you may never have tried before, digging deeper in our Vive community and, of course, having an epic Summer of FUN! 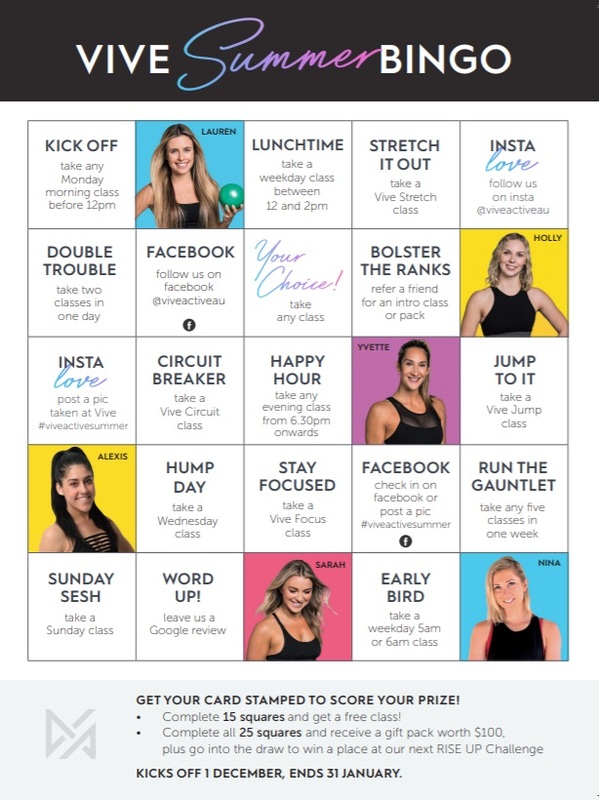 Get your card stamped every time you complete a square – whether it’s taking a hump day or evening class, or posting a pic to Insta – and you’ll soon qualify for a prize. If you complete 15 squares, you earn a free class. Go on to complete all 25 squares and you’ll receive a gift pack worth $100 plus go in the draw to win a place in our next RISE UP Challenge in February next year. To get started, simply grab a card from reception and start playing.